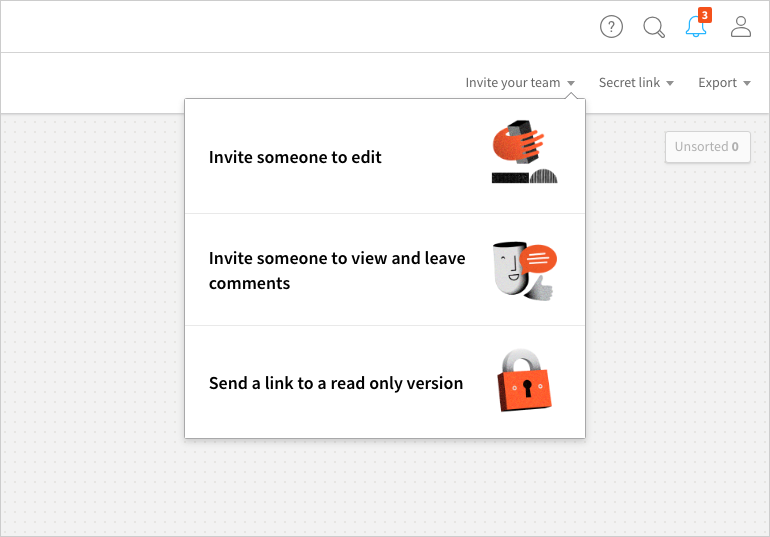 Inviting your team to collaborate in Milanote (whether they have an account or not). The only board you can't share is your Home board. Any other board you create can be shared. Once you're inside the board you'd like to share, click "Invite your team" in the top right corner. Any sub-boards within the board will also be shared. What happens when I share a board with someone? Your shared board will instantly appear in Unsorted notes in their workspace. They'll also receive an email notification. They can drag this board anywhere and start editing straight away. They'll receive an email invite to join Milanote and use it for free. Once they've registered they'll see your shared board in Unsorted notes on their workspace. They can drag this board anywhere and start editing straight away. People without a Milanote account can still view your work if you send them a secret read only link. Learn how.